Home » World » USA & Canada » Hillary Clinton to Run for 2016 President? Hillary Clinton is keeping everyone guessing when it comes to this questions. She is not ready to give a direct answer but keeps hinting at it. In a recent interview with The Daily Show,she dropped tons of hits about running for 2016 President without actually saying she will. Right from the top of the interview segment, Stewart got the ball rolling. 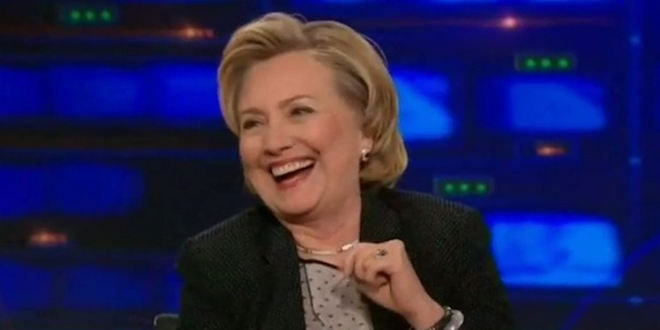 “Jon, I was going to make an announcement, but you kind of spoiled it,” Clinton responded with a laugh. Q: Do you like commuting to work, or do you like a home office? Q: Do you have a favorite shape for that home office? Would you like it to have corners or not to have corners? A: I think the world is so complicated, the fewer corners you have, the better. Q: Do you enjoy constant, non-stop criticism? A: It sort of comes with the territory. Clinton said that a “cottage industry” has sprung up around criticizing and pursuing her. Clinton has caught a lot of flack for how she worded an answer to one person and saying that she and Bill Clinton were “dead broke” when they left the White House in 2000.